On the 8th (Fri), stop by Elliott Bay Book Company. To see reviews, more things to do, maps, and more tourist information, refer to the Seattle holiday maker . Aberdeen, UK to Seattle is an approximately 15-hour flight. You can also do a combination of train and flight; or do a combination of train, flight, and shuttle. The time zone difference when traveling from Aberdeen to Seattle is minus 8 hours. Traveling from Aberdeen in March, expect Seattle to be somewhat warmer, temps between 15°C and 6°C. Finish up your sightseeing early on the 9th (Sat) so you can travel to San Francisco. 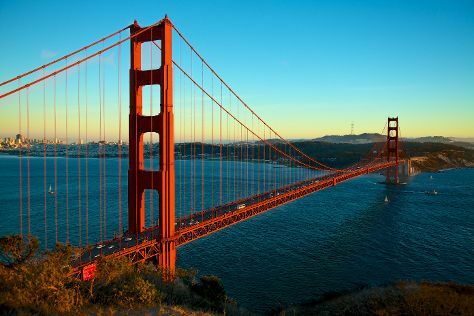 San Francisco is known for nature, museums, parks, nightlife, and shopping. Your plan includes some of its best attractions: snap pictures at Golden Gate Bridge, engage your brain at Exploratorium, catch a ride on Cable Cars, and shop like a local with Union Square. To find reviews, more things to do, maps, and other tourist information, use the San Francisco trip maker app . You can do a combination of flight and subway from Seattle to San Francisco in 4 hours. Other options are to fly; or drive. Plan for somewhat warmer temperatures traveling from Seattle in March, with highs in San Francisco at 21°C and lows at 11°C. Finish your sightseeing early on the 12th (Tue) so you can travel to Las Vegas. Step out of Las Vegas to go to Boulder City and see Hoover Dam, which is approximately 50 minutes away. There's much more to do: take in breathtaking views at Red Rock Canyon National Conservation Area, shop like a local with The Strip, try your luck at Bellagio Hotel and Casino, and admire the local landmark of Bellagio Fountains. To find where to stay, more things to do, and other tourist information, use the Las Vegas travel itinerary planner . You can fly from San Francisco to Las Vegas in 4 hours. Other options are to do a combination of subway and flight; or drive. When traveling from San Francisco in March, plan for a bit warmer days in Las Vegas, with highs around 27°C, while nights are about the same with lows around 13°C. Cap off your sightseeing on the 16th (Sat) early enough to travel to Los Angeles. Change things up with a short trip to Disneyland Park in Anaheim (about 30 minutes away). Pack the 18th (Mon) with family-friendly diversions at Universal Studios Hollywood. And it doesn't end there: examine the collection at The Getty Center, see the sky in a new way at Griffith Observatory, and put a fun spin on your tour with Fantastic Race. Plan my Los Angeles trip by asking Inpirock to come up with tips and suggestions. Traveling by flight from Las Vegas to Los Angeles takes 4 hours. Alternatively, you can fly; or drive. March in Los Angeles sees daily highs of 27°C and lows of 14°C at night. Cap off your sightseeing on the 19th (Tue) early enough to travel back home.